GM-CSF and M-CSF (CSF-1) can enhance macrophage lineage numbers as well as modulate their differentiation and function. Of recent potential significance for the therapy of inflammatory/autoimmune diseases, their blockade in relevant animal models leads to a reduction in disease activity. What the critical actions are of these CSFs on macrophages during inflammatory reactions are unknown. To address this issue, adherent macrophages (GM-BMM and BMM) were first derived from murine bone marrow precursors by GM-CSF and M-CSF, respectively, and stimulated in vitro with LPS to measure secreted cytokine production, as well as NF-κB and AP-1 activities. GM-BMM preferentially produced TNF-α, IL-6, IL-12p70, and IL-23 whereas, conversely, BMM generated more IL-10 and CCL2; strikingly the latter population could not produce detectable IL-12p70 and IL-23. Following LPS stimulation, GM-BMM displayed rapid IκBα degradation, RelA nuclear translocation, and NF-κB DNA binding relative to BMM, as well as a faster and enhanced AP-1 activation. Each macrophage population was also pretreated with the other CSF before LPS stimulation and found to adopt the phenotype of the other population to some extent as judged by cytokine production and NF-κB activity. Thus, GM-CSF and M-CSF demonstrate, at the level of macrophage cytokine production, different and even competing responses with implications for their respective roles in inflammation, including a possible dampening or suppressive role for M-CSF in certain circumstances. The phenotypic diversity of macrophage lineage populations leading to divergent functions, for example at sites of inflammation or immunity, is becoming apparent (1). These cells are able, through the vast array of mediators that they are capable of producing, to control both the progression and resolution of inflammatory lesions (2, 3). Attempts have been made to clarify macrophage phenotypes (subsets) and activation states resulting from exposure to the various stimuli. For example, polarization into the so-called M1 and M2 states has been proposed (2, 4) as has alternate activation states characterized by a classical (proinflammatory) or a nonclassical phenotype (5). Two cytokines, which appear to be important in controlling the numbers and function of macrophage lineage populations in inflammatory conditions, are GM-CSF and M-CSF; also known as CSF-1 (6, 7, 8). These CSFs are also critical to the proper maintenance of steady-state macrophage development, although with different roles. Studies using mice deficient in functional M-CSF (op/op mice) revealed that M-CSF plays a role in the steady-state development of a number of macrophage populations (9, 10). For mice deficient in GM-CSF, the major pathology is alveolar proteinosis (11). GM-CSF has been shown to be essential for proper alveolar macrophage maturation (12). The CSFs are prosurvival/mitogenic factors for macrophage lineage populations; they are also able to “prime” or “activate” macrophages as well as induce their differentiation (7, 13). In vitro studies of CSF action on monocytes/macrophages have shown that they can modulate the expression of common and divergent sets of products (6, 14). GM-CSF is often used in the presence of a costimulus such as IL-4 to generate dendritic cell (DC)3 populations (15) whereas M-CSF is critical for the control of osteoclast development (10). There have been studies in the mouse comparing the actions of these CSFs by generating cell populations via proliferation and differentiation of bone marrow precursors. The GM-CSF-dependent cells derived in this way differ from their M-CSF-derived counterparts in a number of ways (16, 17, 18, 19). There is also evidence that when both CSFs are added to the same monocyte/macrophage population they can compete, leading to a suppression of the cellular response to the other CSF (20, 21). Recently, proinflammatory type-1 and anti-inflammatory type-2 human monocyte-derived macrophage subsets (termed Mφ-1 and Mφ-2) have been generated in the presence of GM-CSF and M-CSF, respectively (1, 22). However, neither the molecular events contributing to the different properties of these subsets nor the potential interplay of the respective CSFs in this system was examined. In the current study, we generated from murine bone marrow precursors GM-CSF- and M-CSF-dependent macrophage populations (GM-BMM and BMM, respectively) and studied, following LPS activation, both the cytokine expression and some of the molecular changes that might help to explain differences in such expression. We also included an analysis of the interplay between the CSFs on subsequent macrophage activation. Female C57BL/6 mice (8–12 wk) were supplied by Monash University, Central Animal Services (Parkville, Victoria, Australia). Reagents were as follows: recombinant murine GM-CSF (PeproTech) and recombinant human M-CSF (Chiron); Abs against RelA, c-Fos, JunB, c-Jun, JunD, β-actin, and β-tubulin (Cell Signaling Technology); p50 Ab (eBioscience); and LPS (Escherichia coli serotype 0127:B8; Sigma-Aldrich). Bone marrow-derived macrophages grown in M-CSF or GM-CSF were generated as previously described (23). On day 7 adherent GM-BMM and BMM (5 × 105 cells/ml) were stimulated with LPS (100 ng/ml) for the indicated time points. For “priming” experiments, BMM at day 7 were stimulated for 16 h with GM-CSF (+GM-CSF; 1000 U/ml GM-CSF and 1000 U/ml M-CSF) or without GM-CSF (−GM-CSF; 1000 U/ml M-CSF). Similarly, GM-BMM at day 7 were stimulated for 16 h with M-CSF (+M-CSF; 1000 U/ml M-CSF and 1000 U/ml GM-CSF) or without M-CSF (−M-CSF; 1000 U/ml GM-CSF). Following pretreatment, BMM and GM-BMM were stimulated with fresh medium containing LPS (100 ng/ml). TNF-α, IL-6, IL-10, IL-12p70, IL-12p40, and CCL2 (OptEIA ELISA kits; BD Pharmingen) and IL-23p40/p19 (eBioscience) content were measured in culture supernatants by ELISA. The MLR was performed as previously described (24). Briefly, purified T cells (2 × 105 cells/well) were cultured with BMM and GM-BMM for 96 h at 37°C in 5% CO2 such that the final E:T ratio was 1:10. Control cultures contained medium or T cells alone. Before harvesting (16 h), cells were pulsed with 1 μCi of [3H]TdR (Amersham Biosciences) and DNA synthesis was measured by [3H]TdR incorporation using a Beckman beta scintillation counter (Beckman Instruments). Results are expressed as the stimulation index above medium alone. Quantitative-PCR (Q-PCR) was performed as before (23). Predeveloped TaqMan probe/primers for TNF-α, IL-6, IL-12p35, IL-12p40, IL-23p19, IL-10, and CCL2 (Applied Biosystems) were used to calculate the threshold cycle numbers that were transformed using the cycle threshold and relative value method as described by the manufacturer and expressed relative to 18S ribosomal RNA. Results are expressed as relative gene expression for each target gene. Whole cell extracts were lysed directly and Western blotting was performed by standard techniques (25). Briefly, cells (3 × 106) were lysed in tissue culture dishes with Nonidet P-40 lysis buffer (20 mM Tris-HCl (pH 7.4), 150 mM NaCl, 1 mM EDTA, 1 mM DTT, 1% Nonidet P-40, 10% glycerol, 1 mM sodium orthovanadate, 0.1 mM sodium molybdate, 10 mM NaF, 5 mM β-glycerophosphate, and Complete protease inhibitors) for 30 min on ice. Lysates were clarified by centrifugation at 13,000 × g for 10 min at 4°C and protein concentrations were measured with a Bio-Rad assay kit. All extracts were stored at −80°C until use. Proteins were separated on a 10% SDS-polyacrylamide gel and transferred onto a nitrocellulose membrane followed by immunoblotting for specific Abs as per the manufacturer’s instructions. Densitometry was performed using Kodak EDAS 1D image analysis software. Generation of nuclear lysates and EMSAs were conducted as before (26). Briefly, cells (8 × 106) were lysed in hypotonic lysis buffer (0.0125% Nonidet P-40, 5 mM HEPES (pH 7.9), 10 mM KCl, and 1.5 mM MgCl2) and nuclei were harvested by centrifugation (13,000 × g for 10 min). Nuclear pellets were incubated in hypertonic extraction buffer (0.025% Nonidet P-40, 5 mM HEPES (pH 7.9), 20% glycerol, 420 mM NaCl, 1.5 mM MgCl2, and 0.2 mM EDTA) for 15 min at 4°C. Nuclear extracts (5 μg) were incubated with labeled probe (50,000 cpm), and resolved on a gel in 0.5× Tris borate-EDTA at 200 V for 20–30 min. Complexes were visualized using Super RX (Fuji Film). For supershift experiments, nuclear extracts were pretreated with 1 μl of a particular Ab and DNA binding complexes were resolved on a nondenaturing 5% (w/v) polyacrylamide gel in 0.1% Tris borate-EDTA. Gels were dried onto 3-mm paper (Whatman) and complexes were visualized as described above. Data are given as mean values ± SEM. Statistical significance was evaluated over the 24-h LPS stimulation period by two-way ANOVA and p < 0.05 was considered statistically significant. Murine bone marrow cells were cultured in vitro for 7 days in the presence of GM-CSF or M-CSF and the adherent cells (GM-BMM and BMM, respectively) were collected. We have shown elsewhere (23) that both populations express common macrophage markers (Mac-1 (CD11b), F4/80, and c-Fms (M-CSFR)), whereas only GM-BMM express CD11c, an integrin often used in murine systems to identify DC lineage cells but also found on certain macrophage populations (e.g., alveolar macrophages (12)). We have also recently demonstrated that both cell types can be quantitatively converted to osteoclast lineage cells (23). In the current study, we demonstrate that GM-BMM cells, relative to BMM cells, are potent stimulators of T cell proliferation in a MLR. As can be seen in Fig. 1⇓A, GM-BMM cells were ∼30-fold more potent than BMM cells at stimulating allogeneic T cells in a MLR. We refer here to the GM-CSF-derived adherent cells as GM-BMM although they are functionally sometimes referred to as DCs (27). Differential stimulatory activity and basal cytokine mRNA expression of GM-BMM and BMM. A, The stimulatory activity of GM-BMM and BMM was measured in an allogeneic MLR. GM-BMM and BMM cells were cultured in triplicate with allogeneic splenic T cells (2 × 105cells/well) at a ratio of 1:10 for 96 h at 37°C in 5% CO2. Cultures were pulsed with ([3H]TdR for the last 16 h to measure DNA synthesis. Control cultures contained medium or T cells alone. Background counts per minute for medium alone was 108 ± 16. The results represent the mean ± SEM of values from three independent experiments. ∗, p < 0.01, for comparison of the stimulation index of GM-BMM vs BMM. B, Basal cytokine mRNA expression in GM-BMM and BMM as measured by Q-PCR. Levels of TNF-α, IL-6, IL-12p35, IL-23p19, IL-12p40, IL-10, and CCL2 mRNA were normalized to an endogenous reference (18S) and calibrated to the lowest expression level for each cytokine. The results represent the mean ± SEM of values from four independent experiments. ∗, p < 0.01, GM-BMM vs BMM for TNF-α; †, p < 0.01, BMM vs GM-BMM for IL-10; ‡, p < 0.05, BMM vs GM-BMM for CCL2. Before LPS stimulation, GM-BMM and BMM cells were unable to secrete detectable TNF-α, IL-6, IL-12p70, IL-23, IL-10, or CCL2 (data not shown), although by Q-PCR we found the basal mRNA expression levels of TNF-α, IL-10, and CCL2 were significantly different (Fig. 1⇑B). The relative basal mRNA levels of TNF-α (p < 0.01; Fig. 1⇑B) were enhanced from GM-BMM compared with BMM, whereas the relative basal mRNA levels of the anti-inflammatory cytokine IL-10 (p < 0.01; Fig. 1⇑B) and the chemokine CCL2 (MCP-1) (p < 0.05; Fig. 1⇑B) were enhanced in BMM compared with GM-BMM. There were no significant differences in the basal mRNA levels for IL-6 or for the IL-12 and IL-23 subunits (IL-12p35, IL-23p19, and IL-12/IL-23 shared subunit p40) between the two macrophage populations. We then went on to determine the cell surface expression of TLR4 and TLR2. As has previously been demonstrated (28), both cell types were uniformly positive for TLR2 and TLR4 and their mean fluorescence intensities were similar (data not shown). Following LPS stimulation, GM-BMM produced significantly more TNF-α (p < 0.01) and IL-6 (p < 0.01) compared with BMM (Fig. 2⇓, A and B, respectively). Both IL-12p70 and IL-23 are composed of two subunits, a common p40 subunit and either a p35 or a p19 subunit, respectively (1). GM-BMM secreted both IL-12p70 and IL-23 following LPS stimulation whereas BMM failed to do so over the 24-h period examined (p < 0.01; Fig. 2⇓, C and D, respectively). LPS-stimulated BMM produced IL-12p40 but at levels lower than for GM-BMM (data not shown). In contrast to the above cytokines and consistent with the basal mRNA expression pattern (Fig. 1⇑B), LPS-stimulated BMM secreted more IL-10 and CCL2 (p < 0.05; Fig. 2⇓, E and F, respectively). The divergent production of the above mediators by GM-BMM and BMM correlated with significantly different LPS-induced mRNA levels of TNF-α, IL-12p35, IL-23p19, IL-12p40, IL-10, and CCL2 (data not shown). Differential cytokine production from GM-BMM and BMM following LPS stimulation. TNF-α (A), IL-6 (B), IL-12p70 (C), IL-23 (D), IL-10 (E), and CCL2 (F) levels from GM-BMM and BMM following LPS (100 ng/ml) stimulation are shown. The results represent the mean ± SEM of values from four independent experiments. Where not visible, error bars are smaller than the symbol. p < 0.01, GM-BMM vs BMM for TNF-α, IL-6, IL-12p70, and IL-23 (A–D); p < 0.05, BMM vs GM-BMM for IL-10 and CCL2 (E and F). Because NF-κB regulates the expression of multiple genes important in immunologic and inflammatory responses (29), we reasoned that there may be differential NF-κB activation. As can be seen in Fig. 3⇓A, the rate of IκBα degradation was different between GM-BMM and BMM in response to LPS. IκBα was completely degraded in GM-BMM within 15 min of LPS stimulation; IκBα could still be detected in BMM at this time point. In both GM-BMM and BMM, IκBα levels were restored after 4 h of LPS stimulation. We next examined translocation of the RelA subunit into the nucleus. 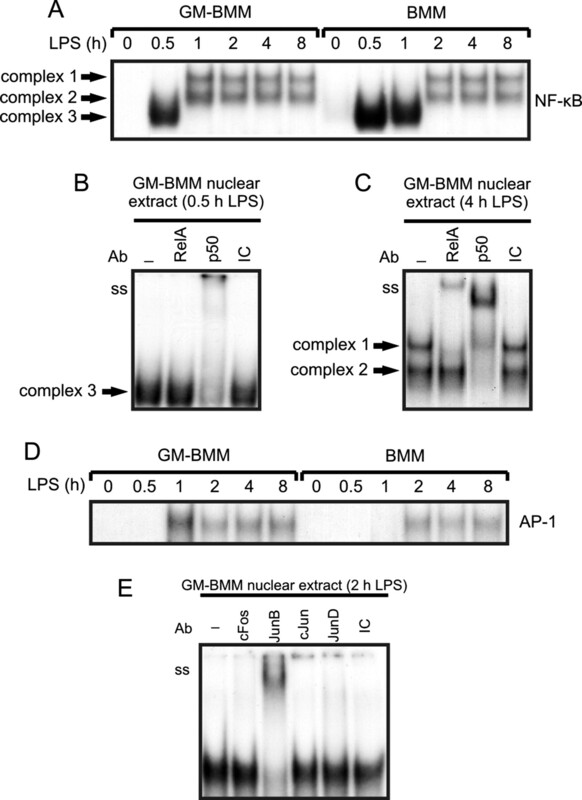 Western blot analysis demonstrated that maximal GM-BMM RelA nuclear levels peaked at ∼0.5–1 h after LPS stimulation (Fig. 3⇓B) and appeared to be slightly greater than those for BMM; for BMM, maximal nuclear RelA levels were not reached until ∼2 h after LPS stimulation (Fig. 3⇓B). 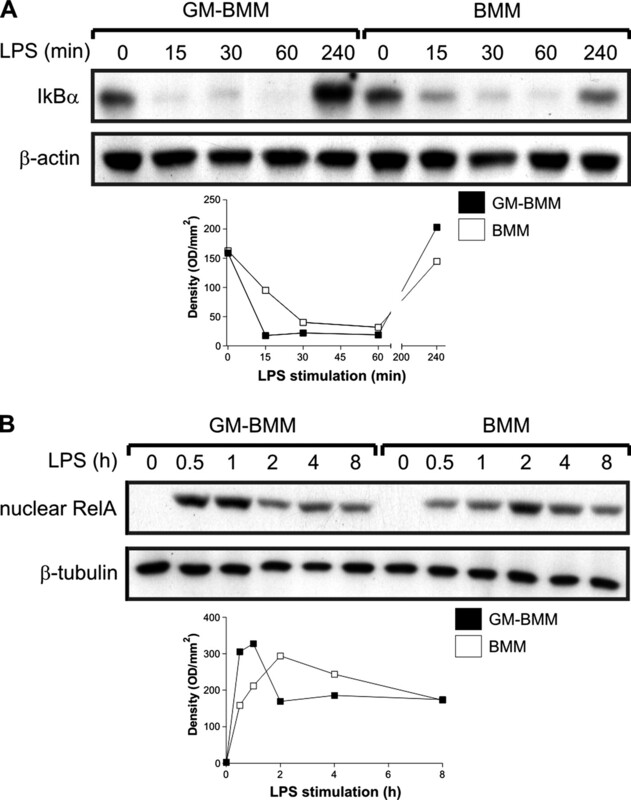 IκBα degradation and RelA nuclear translocation in GM-BMM and BMM following LPS stimulation. A, IκBα degradation was analyzed by Western blotting of whole cell lysates. B, Nuclear translocation of RelA was analyzed by Western blotting. β-Actin and β-tubulin levels were used as loading controls. Densitometric analysis was performed using Quantity One software and data are expressed as density (OD/mm2) relative to that for the β-actin/β-tubulin. Representatives of three independent experiments are shown. To assess the NF-κB DNA binding activity, EMSAs were conducted on nuclear extracts. Before LPS stimulation, NF-κB DNA binding complexes could not be detected in either GM-BMM or BMM (Fig. 4⇓A). However, following LPS addition three distinct NF-κB DNA binding complexes (designated complexes 1, 2, and 3) were formed in both cell populations. Interestingly, the kinetics of complex formation differed. Both GM-BMM and BMM rapidly formed complex 3 within 30 min of LPS stimulation. However, by 1 h of treatment in GM-BMM complex 3 had disappeared and complexes 1 and 2 had formed, whereas in BMM complex 3 was still present while the formation of complexes 1 and 2 was delayed until 2 h after LPS activation. Both complexes 1 and 2 were maintained over the duration of the 8-h stimulation period examined in both cell populations. NF-κB and AP-1 DNA binding in GM-BMM and BMM following LPS stimulation. A, NF-κB DNA binding activity was analyzed by EMSA. B and C, Supershift analysis of NF-κB DNA binding complexes with Abs recognizing indicated NF-κB proteins and isotype control (IC) Ab. D, AP-1 DNA binding activity was analyzed by EMSA. E, Supershift analysis of the AP-1 DNA binding complex with Abs recognizing the indicated AP-1 proteins and the isotope control (IC) Ab. Representatives of three independent experiments are shown. To assess the composition of the three complexes, supershift analysis of GM-BMM treated with LPS for 30 min and 4 h was conducted. For the 30-min LPS treatment anti-p50 Ab completely displaced complex 3 (supershift), while anti-RelA failed to supershift it (Fig. 4⇑B). This observation is consistent with complex 3 containing p50, most likely as a homodimer (30). Supershift analysis of GM-BMM following 4 h LPS stimulation was used to help reveal the composition of complexes 1 and 2. Fig. 4⇑C demonstrates that the anti-RelA Ab displaced complex 1 (supershift) whereas anti-p50 Ab displaced both complex 1 and complex 2 (supershift). Supershift analyses of the corresponding time points for BMM lysates gave similar results (data not shown). In summary, following LPS treatment GM-BMM, compared with BMM, displayed more rapid IκBα degradation, RelA translocation and formation of a RelA-containing DNA binding complex. It is possible that these differences may relate to the heightened expression in GM-BMM of TNF-α, IL-12p70, and IL-23 (Fig. 2⇑), for example, the genes of which have been shown to be regulated by NF-κB activity (29). Cooperation between NF-κB and AP-1 is known to be important for the activation of certain cytokine promoters (31). As for NF-κB, before LPS stimulation no AP-1 binding could be detected in either GM-BMM or BMM (Fig. 4⇑D). Following LPS addition, a single DNA binding complex was evident for both cell types with the maximal activity being higher in GM-BMM. Similar to the NF-κB DNA binding kinetics (Fig. 4⇑A), those for AP-1 DNA binding were also different. AP-1 DNA binding was rapidly induced within 1 h after LPS treatment in GM-BMM; the formation of AP-1 DNA binding was delayed in BMM until around 2 h after LPS addition. In both GM-BMM and BMM, AP-1 DNA binding was maintained over the 8-h LPS stimulation period examined. Supershift analysis of GM-BMM following 2 h of LPS treatment was used to assess the composition of the DNA binding complex. The anti-JunB Ab completely displaced the complex (supershift), while anti-c-Fos, anti-c-Jun, and anti-JunD failed to supershift it (Fig. 4⇑E). This observation is consistent with the AP-1 DNA binding complex containing JunB, which is known to form transcriptionally active homodimers (32). Supershift analysis of the corresponding time point for BMM lysates gave similar results (data not shown). Particularly at sites of inflammation (33, 34) it is likely that macrophage populations in vivo will be exposed to both CSFs. We next addressed the question as to whether the respective secretory phenotypes of GM-BMM and BMM could be converted to that of the other, at least to some extent. To assess the effect that GM-CSF has on BMM cytokine production, BMM cells were cultured for an additional 16 h with or without GM-CSF (M-CSF was also added to both treatment groups during this period). Following GM-CSF pretreatment, BMM cells were not significantly altered in terms of their cell surface Ag expression, at least as judged by CD11c, TLR2, and TLR4 levels (data not shown). However, following the GM-CSF pretreatment of BMM, basal mRNA levels of TNF-α, IL-23p19, and IL-12p40 were increased while IL-10 mRNA levels were decreased (data not shown). Consistent with the altered basal mRNA expression, following LPS stimulation GM-CSF-treated BMM cells produced increased amounts of TNF-α (p < 0.05; Fig. 5⇓A) and were now capable of producing IL-12p70 (Fig. 5⇓B) and IL-23 (Fig. 5⇓C), albeit at lower levels and with delayed kinetics compared with that found for GM-BMM (Fig. 2⇑, C and D). BMM cells pretreated with GM-CSF were also capable of significantly greater IL-12p40 production after LPS activation (data not shown). 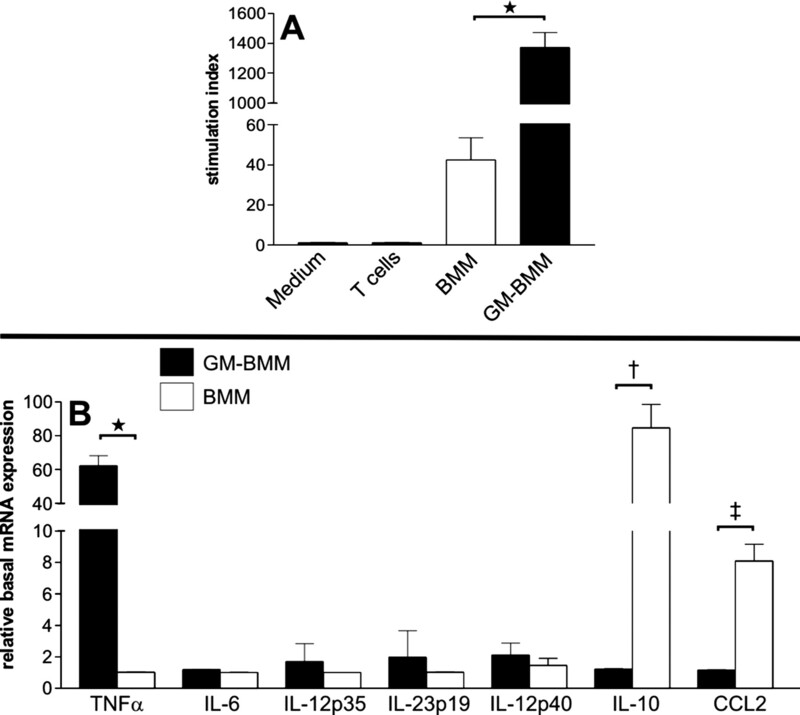 Interestingly, the levels of IL-10 and CCL2, the mediators whose levels were higher for BMM compared with GM-BMM following LPS stimulation (Fig. 2⇑, E and F), were not altered by GM-CSF pretreatment (data not shown). 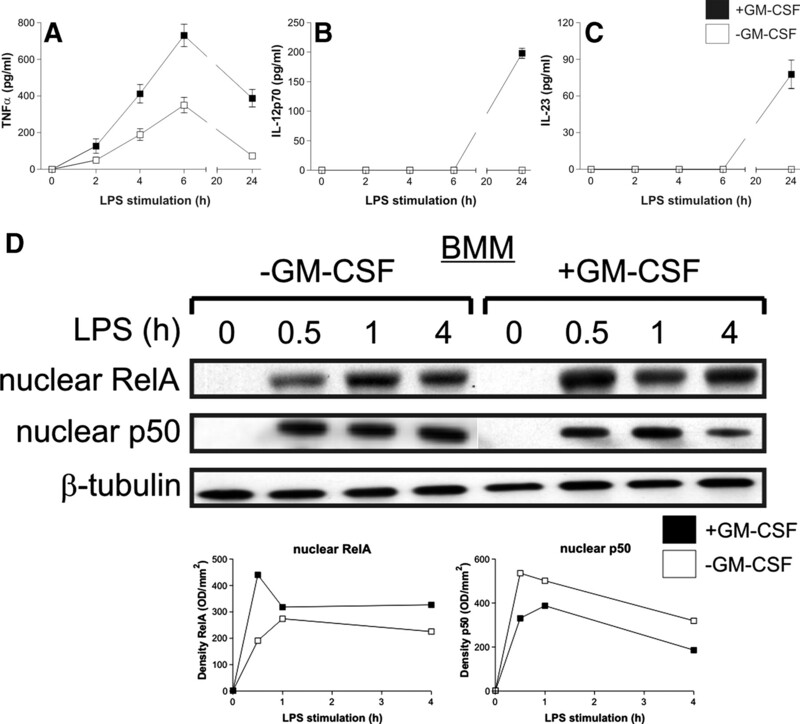 Cytokine production and nuclear localization of RelA and p50 from LPS-stimulated BMM following pretreatment with GM-CSF. Day 7 BMM cells were pretreated with or without GM-CSF (1000 U/ml) in the presence of M-CSF for 16 h and then stimulated with LPS. A–C, TNF-α (A), IL-12p70 (B), and IL-23 (C) production was measured. The results represent the mean ± SEM of cytokine values from four independent experiments. Where not visible, error bars are smaller than the symbol. p < 0.05, +GM-CSF vs −GM-CSF for TNF-α (A); p < 0.01, +GM-CSF vs −GM-CSF for IL-12p70 (B) and IL-23 (C). D, Nuclear localization of RelA and p50 was measured by Western blotting in lysates from BMM, pretreated with or without GM-CSF. Densitometric analysis was performed using Quantity One software and data are expressed as density (OD/mm2) relative to that for β-tubulin. Representatives of three independent experiments are shown. Western blot analysis demonstrated that GM-CSF pretreatment of BMM enhanced the nuclear localization of RelA while decreasing that of p50 (Fig. 5⇑D). By EMSA, in BMM pretreated with GM-CSF there was an increased formation of complex 1 compared with control BMM grown solely in M-CSF at 1 and 4 h after LPS stimulation (data not shown). Supershift analysis, as in Fig. 4⇑C, revealed that complex 1 contained transcriptionally active RelA. This increased formation of RelA-containing complexes following GM-CSF pretreatment correlated with the enhanced relative nuclear localization of RelA (Fig. 5⇑D). Likewise, GM-BMM cells were cultured for an additional 16 h with or without M-CSF (GM-CSF was also added to both treatment groups during this period). Again, flow cytometry revealed no significant changes in CD11c, TLR2, or TLR4 levels following pretreatment with M-CSF (data not shown). However, following the pretreatment, mRNA levels of TNF-α, IL-23p19, and IL-12p40 were decreased while CCL2 mRNA levels were enhanced (data not shown). These altered basal mRNA levels correlated with the subsequent diminished LPS-induced production of TNF-α (p < 0.05; Fig. 6⇓A) and IL-12p70 (p < 0.05; Fig. 6⇓B) by GM-BMM cells pretreated with M-CSF; these cells also produced significantly less IL-23 (p < 0.05; Fig. 6⇓C). The M-CSF pretreatment led to significantly greater production of CCL2 (p < 0.05; Fig. 6⇓D) but once again there was no effect on the production of IL-10 (data not shown). 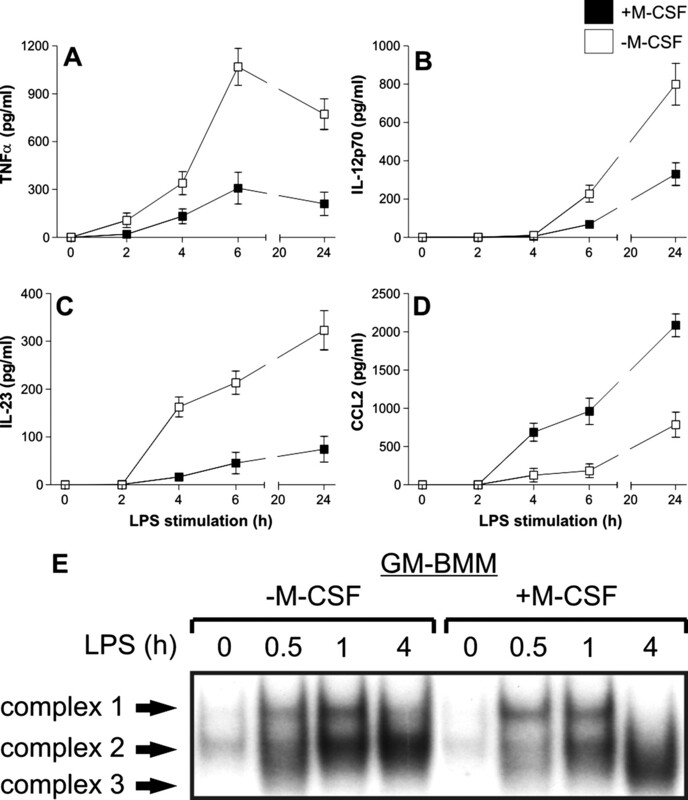 Modulation of cytokine production and NF-κB DNA binding activity from LPS-stimulated GM-BMM following pretreatment with M-CSF. Day 7 GM-BMM were treated with or without M-CSF (1000 U/ml) in the presence of GM-CSF for 16 h and then stimulated with LPS. A–D, TNF-α (A), IL-12p70 (B), IL-23 (C), and CCL2 (D) production was measured. The results represent the mean ± SEM of cytokine values from four independent experiments. Where not visible, error bars are smaller than the symbol. p < 0.05, −M-CSF vs +M-CSF for TNF-α (A), IL-12p70 (B), and IL-23 (C); p < 0.05, +M-CSF vs −M-CSF for CCL2 (D). E, NF-κB DNA binding activity was analyzed by EMSA using nuclear lysates from GM-BMM treated with or without M-CSF (1000 U/ml) for 16 h and then stimulated with LPS. Representatives of three independent experiments are shown. 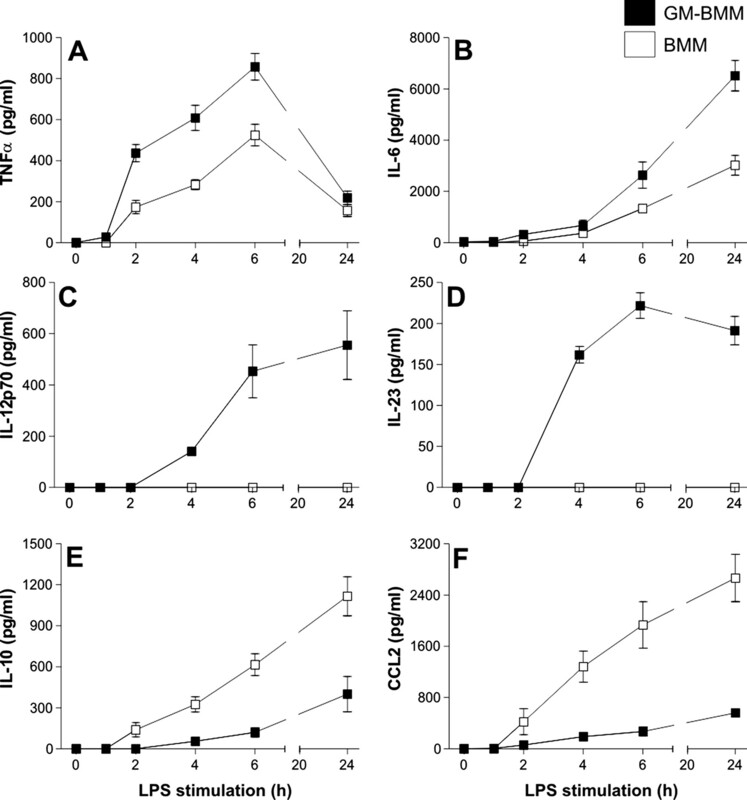 GM-BMM pretreated with M-CSF rapidly formed complexes 1 and 2 after LPS stimulation (Fig. 6⇑E, +M-CSF), as did the control GM-BMM grown solely in GM-CSF (Fig. 6⇑E, −M-CSF). However, by 4 h after LPS stimulation complex 3 was the major complex present in the GM-BMM cells pretreated with M-CSF, whereas complexes 1 and 2 were still present in the control GM-BMM cells grown solely in GM-CSF (Fig. 6⇑E). Supershift studies of the two treatment groups following 4 h of LPS stimulation revealed that complex 1, formed in the control GM-BMM, contained RelA whereas complex 3, formed in GM-BMM pretreated with M-CSF, corresponded to the transcriptionally inactive p50 homodimer (see Fig. 4⇑, B and C). It was noted that the control GM-BMM cells that received the additional GM-CSF without M-CSF displayed altered NF-κB DNA binding kinetics. NF-κB DNA binding complexes 1 and 2 were seen 0.5 h after LPS stimulation in these GM-BMM cells (Fig. 6⇑E, −M-CSF) whereas in day 7 GM-BMM, which last received GM-CSF on day 4 of culture, these complexes were not detected until 1 h after LPS stimulation (Fig. 4⇑A). Similarly, the control BMM that received the additional M-CSF without GM-CSF formed NF-κB DNA binding complexes 1 and 2 at 1 h after LPS stimulation (data not shown), whereas we showed earlier that in day 7 BMM cells, which last received M-CSF on day 4 of culture, these complexes were not detected until 2 h after LPS stimulation (Fig. 4⇑A). The addition of M-CSF to BMM before LPS activation has been shown to enhance the NF-κB activity compared with BMM “starved” of M-CSF (35). In summary, it is possible that the above effects on NF-κB may relate to the altered expression of, for example, TNF-α, IL-12p70, and IL-23 from BMM and GM-BMM cells following GM-CSF or M-CSF pretreatment (Figs. 5⇑ and 6⇑). We showed above that LPS stimulation led to a very different pattern of cytokine production, with the GM-BMM cells preferentially producing TNF-α, IL-6, IL-12p70 and IL-23 and the BMM cells preferentially producing IL-10 and CCL2. What was particularly striking was the lack of production of IL-12p70 and IL-23 from the LPS-stimulated BMM. These findings are similar to what has been found recently when human monocytes were differentiated by GM-CSF or M-CSF with the resultant macrophage populations termed Mφ-1 and Mφ-2, respectively (1, 22). In terms of their cytokine profile, GM-BMM resemble classically activated or M1-polarized macrophages that result in response to IFN-γ or microbial products (5), which is perhaps not surprising given that GM-CSF and IFN-γ have many of the same “priming” properties on monocytes and macrophages (36). As for M1 macrophages (4, 5), GM-BMM cells were weak producers of IL-10. In contrast, following LPS stimulation BMM cells appear similar to the Mφ-2 human monocyte-derived macrophages with an IL-12lowIL-10high phenotype and with the capability of high CCL2 production (1, 22). It has been proposed that Mφ-2 cells may play a role in both attracting, via chemokine activity, and then suppressing, via IL-10, adaptive immune cells (1, 22). In the mouse, ligation of a Fc receptor followed by TLR, CD40, or CD44 stimulation also gives rise to macrophages with an IL-12lowIL-10high phenotype that are called type II-activated macrophages (5). BMM cells also seem similar to tumor-associated macrophages with a polarized M2 phenotype capable of high IL-10 production (4, 37). The contribution of endogenous IL-10 (28) to cytokine protein expression in BMM cells is currently being examined. We also analyzed NF-κB and AP-1 activation. Following LPS stimulation, GM-BMM showed a faster IκBα degradation that correlated with the faster nuclear translocation of RelA and the formation of a NF-κB DNA binding complex containing RelA. This subunit can form homodimers or the classical RelA/p50 heterodimer, both of which are potent activators of gene expression (38). Even though we could not detect NF-κB activity in GM-BMM in the absence of LPS stimulation there were differences in basal cytokine mRNA expression from BMM, which might be due to differences in the levels of NF-κB/Rel family members; in this context, a study profiling gene expression in DCs, generated by culturing human monocytes in GM-CSF and IL-4, and in macrophages, generated by culturing them in M-CSF, showed that the expression of several NF-κB/Rel family genes was relatively up-regulated in the former (39). The relatively delayed IκBα degradation and RelA nuclear translocation in LPS-stimulated BMM cells is reminiscent of the phenotypes of tumor-associated macrophages and MyD88-deficient macrophages (40, 41), both of which are relatively poor producers of proinflammatory cytokines. BMM also showed relatively prolonged formation of a NF-κB DNA binding complex most likely corresponding to p50 homodimers. p50 lacks a transactivation domain (42). In this context, TNF-α mRNA levels, which were significantly lower in LPS-stimulated BMM than in LPS-stimulated GM-BMM, are thought to be reduced by p50 binding to κB elements in the TNF-α promoter (43, 44). Furthermore, p50 has recently been shown to promote the transcription of IL-10 (45) and we found here that IL-10 mRNA levels were significantly up-regulated in BMM compared with GM-BMM following LPS treatment. Interestingly, in that prior study (45) it was shown that macrophages generated from p50-deficient mice exhibited a skewed cytokine response to LPS characterized by decreased IL-10 and increased TNF-α and IL-12 production and that RelA and c-rel primarily regulated the expression of TNF-α and IL-12 but played little or no role in driving IL-10 expression (45). Consistent with this observation, IL-10 expression was found to relate to high levels of p50 expression (46), and the inhibition of RelA-containing complexes up-regulated IL-10 production (47). Even though further analysis is obviously warranted, it would appear that our findings are at least consistent with these studies linking NF-κB DNA binding activity and relative cytokine expression. GM-BMM cells displayed faster and enhanced AP-1 activation in response to LPS than did BMM cells. NF-κB regulates the expression of AP-1 family genes (48) and there appears to be significant crosstalk between the two pathways (49). Because AP-1 activity appears to play a role in the regulation of IL-12 (50) and TNF-α (51), for example, our findings on the relative AP-1 activities of stimulated GM-BMM and BMM could also help to explain the relative cytokine profiles. Given that GM-BMM cells display a proinflammatory profile upon LPS stimulation and that GM-CSF has been reported to have many of the same “priming” properties as IFN-γ on macrophages (34, 36), we therefore explored the effects of GM-CSF on the cytokine profile of BMM. The addition of GM-CSF to BMM cultures of itself did not lead to detectable cytokine production. However, with this “priming” protocol the LPS-stimulated BMM cells were now capable of producing IL-12p70 and IL-23 as well as more TNF-α. In other words, the BMM cells could be altered to adopt to some extent the pattern of the GM-BMM cell response. “Priming” of BMM with GM-CSF resulted in increased RelA nuclear translocation and the formation of a RelA-containing NF-κB DNA binding complex, possibly helping to explain some of these cytokine changes. Likewise, GM-BMM, when treated with M-CSF, could also adopt the BMM phenotype to some degree by producing less IL-12p70, IL-23, and TNF-α but more CCL2 following LPS stimulation. This M-CSF pretreatment resulted in the loss of the RelA-containing NF-κB DNA binding complex, which again may help explain the observed changes in cytokine production. In contrast, M-CSF enhanced the production of CCL2 but had no effect on LPS-induced IL-10 production from GM-BMM cells. Taken together, these data show that cytokine production joins the list of responses where GM-CSF and M-CSF can have opposing actions on macrophage populations (20, 21). Several of our findings point to a clear “proinflammatory” function for GM-CSF on macrophage populations, consistent with it acting at sites of inflammation where its levels are elevated above the normally low steady-state levels (34). In vivo it is likely that macrophage populations will be normally exposed to the ubiquitously expressed M-CSF, thereby controlling their numbers in many tissues (9, 52). BMM cells preferentially expressed IL-10 and, when added to GM-BMM, M-CSF suppressed the elevated TNF-α, IL-12p70, and IL-23 production; these latter responses of macrophages to M-CSF, as well as others (20, 21), indicate that it may dampen inflammation in certain circumstances. Perhaps part of its homeostatic role in the steady state is to provide “protection” from or “resistance” to inappropriate proinflammatory signals being imparted to the macrophage. The influence that each CSF has on the expression of components of the NF-κB/Rel and AP-1 signaling pathway is currently under investigation and may help our understanding of the role of these CSFs in macrophage-dependent inflammatory responses. We thank Jennifer Davis for assistance with the maintenance and care of the mice. ↵1 This work was supported by a grant and a Senior Principal Research Fellowship (to J.A.H.) from the National Health and Medical Research Council of Australia. ↵3 Abbreviations used in this paper: DC, dendritic cell; BMM, M-CSF-dependent murine bone marrow-derived macrophage; GM-BMM, GM-CSF-dependent murine bone marrow-derived macrophage; Mφ-1, proinflammatory type-1 human monocyte-derived subset; Mφ-2, anti-inflammatory type-2 human monocyte-derived macrophage subset; Q-PCR, quantitative PCR. Verreck, F. A., T. de Boer, D. M. Langenberg, M. A. Hoeve, M. Kramer, E. Vaisberg, R. Kastelein, A. Kolk, R. de Waal-Malefyt, T. H. Ottenhoff. 2004. Human IL-23-producing type 1 macrophages promote but IL-10-producing type 2 macrophages subvert immunity to (myco)bacteria. Proc. Natl. Acad. Sci. USA 101: 4560-4565. Taylor, P. R., L. Martinez-Pomares, M. Stacey, H. H. Lin, G. D. Brown, S. Gordon. 2005. Macrophage receptors and immune recognition. Annu. Rev. Immunol. 23: 901-944. Hamilton, J. A., E. R. Stanley, A. W. Burgess, R. K. Shadduck. 1980. Stimulation of macrophage plasminogen activator activity by colony-stimulating factors. J. Cell. Physiol. 103: 435-445. Metcalf, D.. 1991. Control of granulocytes and macrophages: molecular, cellular, and clinical aspects. Science 254: 529-533. Wiktor-Jedrzejczak, W., E. Urbanowska, S. L. Aukerman, J. W. Pollard, E. R. Stanley, P. Ralph, A. A. Ansari, K. W. Sell, M. Szperl. 1991. Correction by CSF-1 of defects in the osteopetrotic op/op mouse suggests local, developmental, and humoral requirements for this growth factor. Exp. Hematol. 19: 1049-1054. Tanaka, S., N. Takahashi, N. Udagawa, T. Tamura, T. Akatsu, E. R. Stanley, T. Kurokawa, T. Suda. 1993. Macrophage colony-stimulating factor is indispensable for both proliferation and differentiation of osteoclast progenitors. J. Clin. Invest. 91: 257-263. Paine, R., 3rd, S. B. Morris, H. Jin, S. E. Wilcoxen, S. M. Phare, B. B. Moore, M. J. Coffey, G. B. Toews. 2001. Impaired functional activity of alveolar macrophages from GM-CSF-deficient mice. Am. J. Physiol. 281: L1210-L1218. Hamilton, J. A.. 1993. Colony stimulating factors, cytokines and monocyte-macrophages—some controversies. Immunol. Today 14: 18-24. Hashimoto, S., T. Suzuki, H. Y. Dong, N. Yamazaki, K. Matsushima. 1999. Serial analysis of gene expression in human monocytes and macrophages. Blood 94: 837-844. Masurier, C., C. Pioche-Durieu, B. M. Colombo, R. Lacave, F. M. Lemoine, D. Klatzmann, M. Guigon. 1999. Immunophenotypical and functional heterogeneity of dendritic cells generated from murine bone marrow cultured with different cytokine combinations: implications for anti-tumoral cell therapy. Immunology 96: 569-577. Falk, L. A., L. M. Wahl, S. N. Vogel. 1988. Analysis of Ia antigen expression in macrophages derived from bone marrow cells cultured in granulocyte-macrophage colony-stimulating factor or macrophage colony-stimulating factor. J. Immunol. 140: 2652-2660. Fischer, H. G., S. Frosch, K. Reske, A. B. Reske-Kunz. 1988. Granulocyte-macrophage colony-stimulating factor activates macrophages derived from bone marrow cultures to synthesis of MHC class II molecules and to augmented antigen presentation function. J. Immunol. 141: 3882-3888. Falk, L. A., S. N. Vogel. 1990. Differential production of IFN-α/β by CSF-1- and GM-CSF-derived macrophages. J. Leukocyte Biol. 48: 43-49. Tadokoro, C. E., I. de Almeida Abrahamsohn. 2001. Bone marrow-derived macrophages grown in GM-CSF or M-CSF differ in their ability to produce IL-12 and to induce IFN-γ production after stimulation with Trypanosoma cruzi antigens. Immunol. Lett. 77: 31-38. Willman, C. L., C. C. Stewart, V. Miller, T. L. Yi, T. B. Tomasi. 1989. Regulation of MHC class II gene expression in macrophages by hematopoietic colony-stimulating factors (CSF): induction by granulocyte/macrophage CSF and inhibition by CSF-1. J. Exp. Med. 170: 1559-1567. Phillips, W. A., J. A. Hamilton. 1990. Colony stimulating factor-1 is a negative regulator of the macrophage respiratory burst. J. Cell. Physiol. 144: 190-196. Verreck, F. A., T. de Boer, D. M. Langenberg, L. van der Zanden, T. H. Ottenhoff. 2006. Phenotypic and functional profiling of human proinflammatory type-1 and anti-inflammatory type-2 macrophages in response to microbial antigens and IFN-γ- and CD40L-mediated costimulation. J. Leukocyte Biol. 79: 285-293. Lari, R., A. J. Fleetwood, P. D. Kitchener, A. D. Cook, D. Pavasovic, P. J. Hertzog, J. A. Hamilton. 2007. Macrophage lineage phenotypes and osteoclastogenesis-complexity in the control by GM-CSF and TGF-β. Bone 40: 323-336. Cook, A. D., E. L. Braine, J. A. Hamilton. 2003. The phenotype of inflammatory macrophages is stimulus dependent: implications for the nature of the inflammatory response. J. Immunol. 171: 4816-4823. De Nardo, D., P. Masendycz, S. Ho, M. Cross, A. J. Fleetwood, E. C. Reynolds, J. A. Hamilton, G. M. Scholz. 2005. A central role for the Hsp90.Cdc37 molecular chaperone module in interleukin-1 receptor-associated-kinase-dependent signaling by toll-like receptors. J. Biol. Chem. 280: 9813-9822. Lawrence, T., M. Bebien, G. Y. Liu, V. Nizet, M. Karin. 2005. IKKα limits macrophage NF-κB activation and contributes to the resolution of inflammation. Nature 434: 1138-1143. Inaba, K., R. M. Steinman, M. W. Pack, H. Aya, M. Inaba, T. Sudo, S. Wolpe, G. Schuler. 1992. Identification of proliferating dendritic cell precursors in mouse blood. J. Exp. Med. 175: 1157-1167. Kamada, N., T. Hisamatsu, S. Okamoto, T. Sato, K. Matsuoka, K. Arai, T. Nakai, A. Hasegawa, N. Inoue, N. Watanabe, et al 2005. Abnormally differentiated subsets of intestinal macrophage play a key role in Th1-dominant chronic colitis through excess production of IL-12 and IL-23 in response to bacteria. J. Immunol. 175: 6900-6908. Tak, P. P., G. S. Firestein. 2001. NF-κB: a key role in inflammatory diseases. J. Clin. Invest. 107: 7-11. May, M. J., S. Ghosh. 1997. Rel/NF-κB and I κB proteins: an overview. Semin. Cancer Biol. 8: 63-73. Xiao, W., D. R. Hodge, L. Wang, X. Yang, X. Zhang, W. L. Farrar. 2004. NF-κB activates IL-6 expression through cooperation with c-Jun and IL6-AP1 site, but is independent of its IL6-NFκB regulatory site in autocrine human multiple myeloma cells. Cancer Biol. Ther. 3: 1007-1017. Kouzarides, T., E. Ziff. 1988. The role of the leucine zipper in the fos-jun interaction. Nature 336: 646-651. Hamilton, J. A.. 1993. Rheumatoid arthritis: opposing actions of haemopoietic growth factors and slow-acting anti-rheumatic drugs. Lancet 342: 536-539. Sweet, M. J., C. C. Campbell, D. P. Sester, D. Xu, R. C. McDonald, K. J. Stacey, D. A. Hume, F. Y. Liew. 2002. Colony-stimulating factor-1 suppresses responses to CpG DNA and expression of toll-like receptor 9 but enhances responses to lipopolysaccharide in murine macrophages. J. Immunol. 168: 392-399. Hayes, M. P., J. Wang, M. A. Norcross. 1995. Regulation of interleukin-12 expression in human monocytes: selective priming by interferon-γ of lipopolysaccharide-inducible p35 and p40 genes. Blood 86: 646-650. Sica, A., A. Saccani, B. Bottazzi, N. Polentarutti, A. Vecchi, J. van Damme, A. Mantovani. 2000. Autocrine production of IL-10 mediates defective IL-12 production and NF-κB activation in tumor-associated macrophages. J. Immunol. 164: 762-767. Ghosh, S., M. J. May, E. B. Kopp. 1998. NF-κB and Rel proteins: evolutionarily conserved mediators of immune responses. Annu. Rev. Immunol. 16: 225-260. Baltathakis, I., O. Alcantara, D. H. Boldt. 2001. Expression of different NF-κB pathway genes in dendritic cells (DCs) or macrophages assessed by gene expression profiling. J. Cell. Biochem. 83: 281-290. Baldwin, A. S., Jr. 1996. The NF-κB and I κB proteins: new discoveries and insights. Annu. Rev. Immunol. 14: 649-683. Bohuslav, J., V. V. Kravchenko, G. C. Parry, J. H. Erlich, S. Gerondakis, N. Mackman, R. J. Ulevitch. 1998. Regulation of an essential innate immune response by the p50 subunit of NF-κB. J. Clin. Invest. 102: 1645-1652. Kastenbauer, S., H. W. Ziegler-Heitbrock. 1999. NF-κB1 (p50) is upregulated in lipopolysaccharide tolerance and can block tumor necrosis factor gene expression. Infect. Immun. 67: 1553-1559. Cao, S., X. Zhang, J. P. Edwards, D. M. Mosser. 2006. NF-κB1 (p50) Homodimers differentially regulate pro- and anti-inflammatory cytokines in macrophages. J. Biol. Chem. 281: 26041-26050. Ziegler-Heitbrock, H. W., T. Sternsdorf, J. Liese, B. Belohradsky, C. Weber, A. Wedel, R. Schreck, P. Bauerle, M. Strobel. 1993. Pyrrolidine dithiocarbamate inhibits NF-κB mobilization and TNF production in human monocytes. J. Immunol. 151: 6986-6993. Carayol, N., J. Chen, F. Yang, T. Jin, L. Jin, D. States, C. Y. Wang. 2006. A dominant function of IKK/NF-κB signaling in global LPS-induced gene expression. J. Biol. Chem. 281: 31142-31151. Fujioka, S., J. Niu, C. Schmidt, G. M. Sclabas, B. Peng, T. Uwagawa, Z. Li, D. B. Evans, J. L. Abbruzzese, P. J. Chiao. 2004. NF-κB and AP-1 connection: mechanism of NF-κB-dependent regulation of AP-1 activity. Mol. Cell. Biol. 24: 7806-7819. Ma, W., K. Gee, W. Lim, K. Chambers, J. B. Angel, M. Kozlowski, A. Kumar. 2004. Dexamethasone inhibits IL-12p40 production in lipopolysaccharide-stimulated human monocytic cells by down-regulating the activity of c-Jun N-terminal kinase, the activation protein-1, and NF-κB transcription factors. J. Immunol. 172: 318-330. Mayo, M. W., A. S. Baldwin. 2000. The transcription factor NF-κB: control of oncogenesis and cancer therapy resistance. Biochim. Biophys. Acta 1470: M55-M62.